The SAID principle is one of my favourite concepts in terms of sports, rehabilitation and patient management. The acronym stands for specific adaptation to imposed demands. The principle implies that when the body is placed under certain stresses and demands then it begins to adapt to those stresses accordingly so that in the future it is better able to withstand them. Simply, if you want to get better at a serve in tennis then you need to practice that serve, if you want to improve your backstroke for swimming then you need to practice and train that. From a physical perspective, take bones for example, mechanical stresses on bones set up a physiological process called wolfs law whereby the bones start to thicken and harden along that line of stress. For example, boxers will have thicker and harder radius’ and ulnas’ as a result of the continual impact of punching into a resistance. When we lift a weight in the gym we place a mechanical stress on the muscles and as a result they need to adapt so that next time they can lift the weight with greater ease. On a more complex level we can start to adapt to learning new motor skills. Activities requiring high levels of co-ordination like brazilian jiu jitsu for example can cause neurons in our brain to grow so we can process the skill and movement faster and signal to our body to move and perform the skill. This principle is really useful when it comes to Osteopathy and looking at designing a rehabilitation and management plan. Firstly, we have to ensure that we are applying the right amount of stress to stimulate a response and then secondly, we stress is appropriate to the patients lifestyle, activities or sports. There’s no point getting a powerlifter to be able to do a 10k run when their sport requires a short burst of maximum effort, similarly, an elderly person may need to create the range of movement to put her shoes and socks on easier so intensive strength training may not be the most appropriate. Making the stress specific is the tricky part to ensure that it has a carry over that will benefit the patient. One of my most disliked forms of rehab involves a swiss ball or bosu ball. Putting the athlete or patient on one of these unstable surfaces with the aim of improving their balance when it comes to their sport or activity on a stable surface is a waste of time. The two tasks require two different reflex mechanisms. It’s the same as wanting to get a stronger right arm but only training the left. The key here is to keep things simple and specific, if you’ve been told that your mid back is stiff due to being stooped over your desk all day then you need to mobilise into extension to counteract that. If your upper and mid back musculature is weak meaning your shoulders round forward under fatigue then you need to look at training muscular endurance of these muscles and developing posterior chain strength to help here. 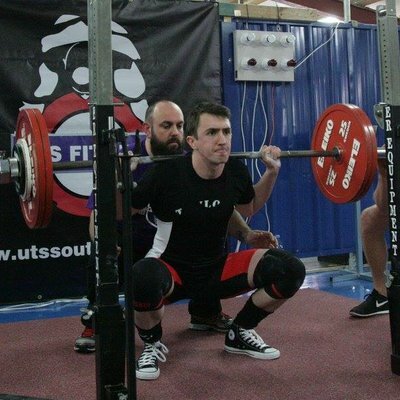 Michael is and Osteopath, trainee strength coach and competitive powerlifter.